Satisfy your hunger between meals with these simple snacks! If you pre-cut fruits and vegetables and keep them stored in baggies or containers in the fridge it makes it easier to just grab a quick snack. 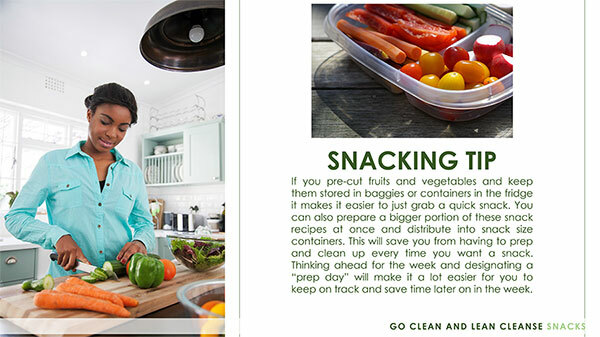 You can also prepare a bigger portion of these snack recipes at once and distribute into snack size containers. This will save you from having to prep and clean up every time you want a snack. Thinking ahead for the week and designating a "prep day" will make it a lot easier for you to keep on track and save time later on in the week. Preheat the oven to 375 F. Position the rack in the center of the oven. In a large bowl, toss the sweet potato slices with the olive oil, arrange the slices in a single layer on two baking sheets. Sprinkle with sea salt. Place the sheets in the preheated oven and bake for about 2 hours, rotating the pans and flipping the chips after 1 hour. 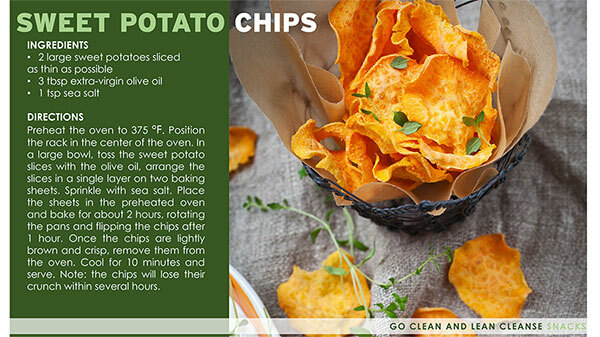 Once the chips are lightly brown and crisp, remove them from the oven. Cool for 10 minutes and serve. Note: the chips will lose their crunch within several hours. Place shredded cucumber in a fine mesh strainer to drain. 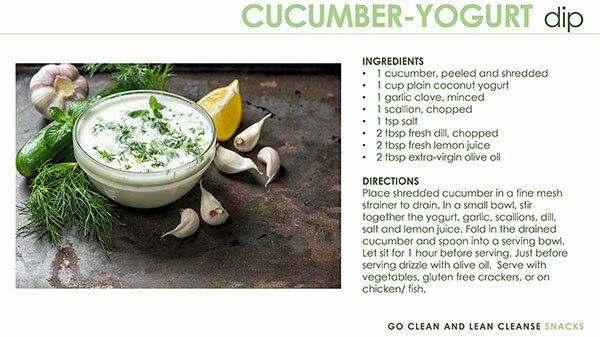 In a small bowl, stir together the yogurt, garlic, scallions, dill, salt and lemon juice. 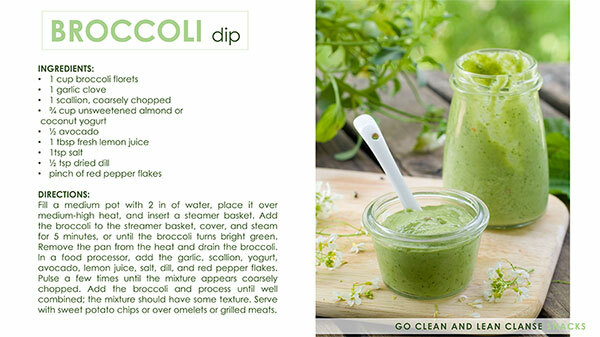 Fold in the drained cucumber and spoon into a serving bowl. Let sit for 1 hour before serving. Just before serving drizzle with olive oil. Serve with vegetables, gluten free crackers, or on chicken/ fish. Fill a medium pot with 2 in of water, place it over medium-high heat, and insert a steamer basket. Add the broccoli to the streamer basket, cover, and steam for 5 minutes, or until the broccoli turns bright green. Remove the pan from the heat and drain the broccoli. In a food processor, add the garlic, scallion, yogurt, avocado, lemon juice, salt, dill, and red pepper flakes. Pulse a few times until the mixture appears coarsely chopped. Add the broccoli and process until well combined; the mixture should have some texture. Serve with sweet potato chips or over omelets or grilled meats. Preheat oven to 275 F. In a large bowl use your hands to mix together the kale and olive oil until the kale is evenly coated. 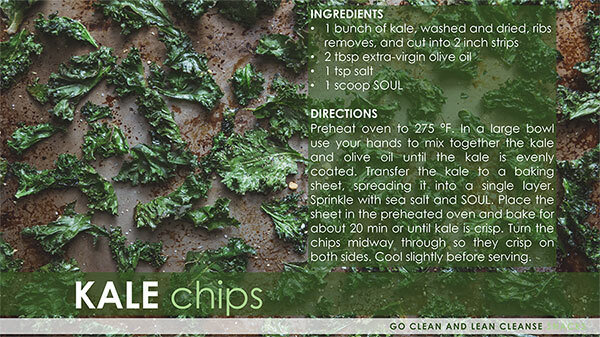 Transfer the kale to a baking sheet, spreading it into a single layer. Sprinkle with sea salt and SOUL. Place the sheet in the preheated oven and bake for about 20 min or until kale is crisp. Turn the chips midway through so they crisp on both sides. Cool slightly before serving. You can really use any fruit you would like for these, these ingredients are just one of the many possibilities for this fruit leather, get creative! Place the fruit in saucepan with the water and bring to a boil. Reduce the heat and simmer until the fruit is soft and the liquid has been reduced. Stir in the cinnamon, HBN Product, and salt. Transfer the fruit to a blender and puree until smooth. Taste the mixture and if required add a honey or maple syrup to sweeten. You should end up with 2-3 cups worth of pureed fruit. Heat oven to 250-300 F. Line a large baking tray with baking paper (if your baking tray is not very large you may need to use two smaller sized trays). Pour the mixture onto the tray and spread it out thinly by using the back of a spatula. You want it to just cover the baking paper's surface without leaving any gaps (the thinner the better). Place the baking tray in the oven on the lowest shelf available and bake for 8-12 hours. 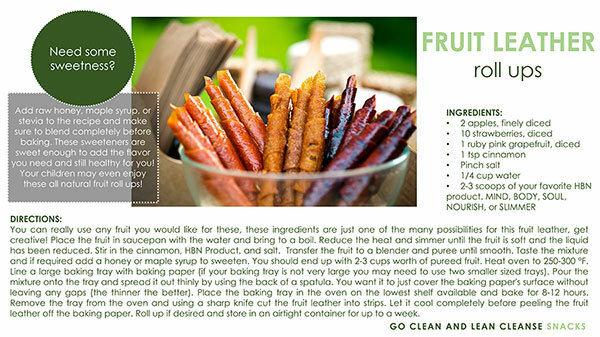 Remove the tray from the oven and using a sharp knife cut the fruit leather into strips. Let it cool completely before peeling the fruit leather off the baking paper. Roll up if desired and store in an airtight container for up to a week. Preheat the oven to 375 F. Pat the drained chickpeas dry with a paper towel. In a small bowl stir together salt, cumin, onion powder, SOUL, chipotle powder, and garlic powder. 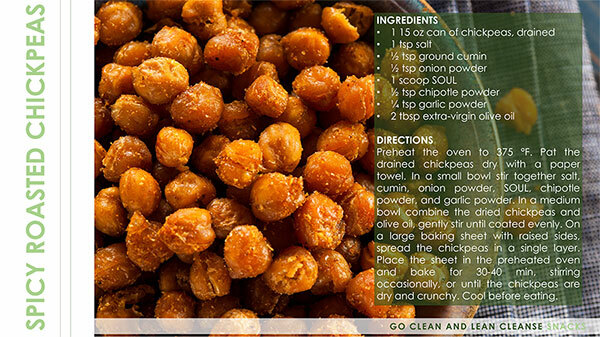 In a medium bowl combine the dried chickpeas and olive oil, gently stir until coated evenly. On a large baking sheet with raised sides, spread the chickpeas in a single layer. Place the sheet in the preheated oven and bake for 30-40 min, stirring occasionally, or until the chickpeas are dry and crunchy. Cool before eating. Set oven to 300 F. In a small bowl, combine the oil, celery salt, BODY or SOUL garlic powder and seasoned salt. 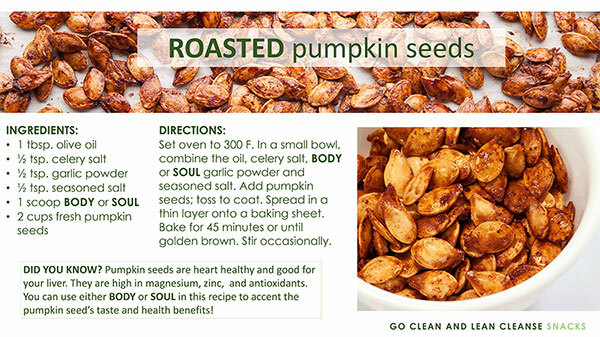 Add pumpkin seeds; toss to coat. Spread in a thin layer onto a baking sheet. Bake for 45 minutes or until golden brown. Stir occasionally.